Over the time WordPress themes have grown strong and web and blog developers have preferred these Simple WordPress Themes over any other available in the market. The ease of use of these themes has been a key advantage of their being popular over any other. Below are listed top 5 of these Simple WordPress Themes which have become popular among bloggers who wish to use these for enhancing the reach of their creativity. zAlive can be said to be the leader of the block in the real sense. A fully responsive theme, zAlive is feature packed and is versatile and multipurpose in the real sense. The theme is available in green and black color; however a key advantage is that these colors can be adjusted with CSS with extreme ease. Availability of a slider and a build in advertisement position are the other key advantages of zAlive. Other range of rich options available include customization of excerpt, primary sidebar layout, navigation menu, CSS style, scripts and some more features. This Customizr blog theme is quite distinct from other in the league as this has some unique features. The blog theme is quite live, given the fact that most of its features can be customized. You can select the skin, logo designs, social profiles, slier features, layouts and some other unique features as live CSS styling. The blog theme has a fully responsive design which is much suitable for small level businesses, blogs, portfolios, corporate websites and landing pages of niche blogs. Another unique advantage of Customizr as a blog theme is that since it was built with Twitter Bootstrap framework, the platform offers many other unique options when it comes to customization. As the name signifies in itself, Corpo is more of a corporate theme; however its use as a blog theme has found favours, given its professional appeal. Simple, clear and professional in its approach, Corpo makes the blog look functional, professional and gives a clean outlook to the whole feel of the blog page. With Corpo at work, you can expect a slider on the homepage, customized widgets which in itself are a key feature for blogs and two distinct menu locations. By having two menu locations, you can manage the blog with more ease. Expect some additional portfolio custom post types which help in showcasing of your work. Moreover, Corpo is a flat design theme which also adds to its exclusivity. Another professional WordPress theme for your blogging endeavor, Attitude is simple yet professional in its approach. A unique advantage of Attitude is that it looks great on high resolution devices like tablets and smartphones. This means that the theme is of much help when you are one the move. With a range of options to choose from, customization of Attitude will be a never ending affair for you and you are likely to enjoy the presence of Attitude in your professional circles. Some of the key features of Attitude include a two site layout including a narrow and a wide approach. The theme also has multiple layouts (five) for each of the page or post, a five page template, five widget areas, four custom widgets and a featured slider which makes highlighting the blog post attractive and easier at the same time. You can add over eleven social icons to this blog theme and this will help you immensely in increasing the reach of your blog. Expect a custom background header, favicon, CSS. This blog theme is also translation ready and you can expect translation in languages as Chinese, Spanish, Norwegian, Russian and German. Multipurpose is another innovative WordPress blog theme which will help you take your blogging endeavor to a new high. Like many other WordPress themes, Multipurpose has been built on a Twitter Bootstrap framework. Other key features of Multipurpose which make the platform blogging friendly include its 100 percent responsiveness, high customization ability and unlimited color scheme. Given the fact that Multipurpose has been built using the Twitter framework, the blog will become more adaptive on various platforms. Infact, Multipurpose is adaptable with any kind of devices including smartphones. Some other features which make this WordPress platform of immense use to blogging include its custom homepage setting, a three page template, additional custom background support and its search engine friendly approach. As the blogging platform is search engine friendly, you can expect to see your blog in the top league, if you focus on quality while writing and editing all kinds of material which your blog receives for further publishing. 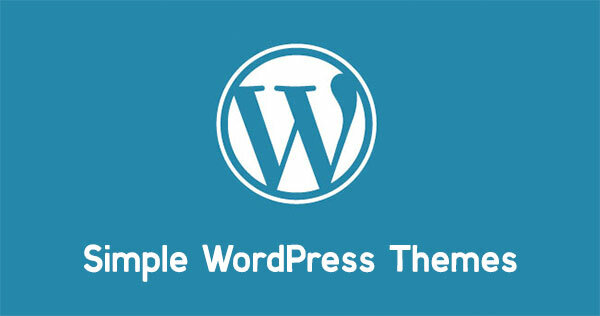 Use any of the listed Simple WordPress Themes and see for yourself, the change it brings to your blogging endeavors.